Are you new to kombucha? Have you been hearing this foreign word come into your life the past few years? Well you have come to the best place on the internet for all things kombucha! Let’s start with a little background on this delish bubbly probiotic tea. Yes, known fact, kombucha is in fact a fermented tea! To learn more about the ins and outs of this drink check out Health-Ade’s video! 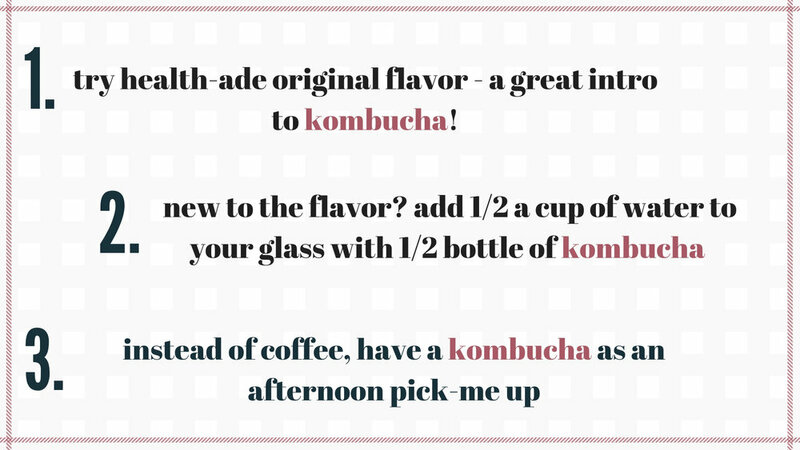 When I first heard about kombucha, I was a freshman in college and a friend had mentioned she loved this bubbly tea! If you know me, I love a good bubble. Bubbly water, bubble italian soda, nitro cold brew, champagne you name it (minus soda!). When she said bubbly tea, I was sold! My college roommate and I headed to our local Co-op and grabbed the first one we could find, it was lady who made it out of her house. We took our first sips and were immediately intrigued. The flavor was mild, but full of body, the bubbles danced on our tongues as we sipped the lightly sweetened tea. Later that week we went to the farmers market and saw a few other local people making their own kombucha and we sampled, bought growlers full, and laughed our way through the farmers market. I found, like coffee that drinking kombucha sparks a joy in me. I find it ritualistic and relaxing knowing that a drink I love so much, has probiotics to aid in my gut health. This treat, I had daily after a long day at school and work was a break in my day where I could reflect, enjoy and just stay present. I know what you are thinking…”wow this girl has a spiritual connection to kombucha...weird.”. But, anyone who is a drinker of kombucha knows that this isn’t just a drink, it truly is a lifestyle of enjoying life, the flavors live brings, and bettering yourself one sip at a time. And heck, Health-Ade kombucha is also delicious! If you are curious about kombucha or ready to start the routine, here are a few easy ways to start adding it in! The key to the kombucha way of life is really giving all flavors a try! Just like anything, I try to start with the least flavored of any food or drink and Health-Ade’s original flavor is delicious on its own! If you love a zest, try the ginger-lemon, and for more berry flavors the Maca-Berry! Are you into greens? Try the Health-Ade Power Greens! There is truly a flavor for everyone, no wrong way to drink it just a great community of fellow booch lovers! So hey, why not make it your ritual too!? Tag me in your pictures of the #BoochLife so I can follow along!